Are you looking for a slice of unspoiled, charming, old world Europe? A road less-travelled to a place rich in history, culture, food, scenery and natural wonders? Are you looking for a slice of unspoiled, charming, old world Europe? A road less-travelled to a place rich in history, culture, food, scenery and natural wonders? If so, let your journey begin in Ljubljana, the capital city of Slovenia - a former member of Yugoslavia that became a part of the E.U. in 2004. With a rich artistic and architectural history and foundation dating back to the Romans, Slovenia is both stunning and scenic. Ljubljana Castle, more a fortress structure than a true castle, is perched atop a hill, overlooking the city of Ljubljana and the Slovenian countryside. With winding trails through the old town leading into a green-lit forest and over a wooden plank bridge straight out of Indiana Jones, the road to this castle is just as striking as the castle itself. Inside, you will find: a gallery, a fancy restaurant in the tower, a lovely café - one of my favorite restaurants in Ljubljana - under billowing white umbrellas in the piazza, and exhibitions inside the structure's walls. 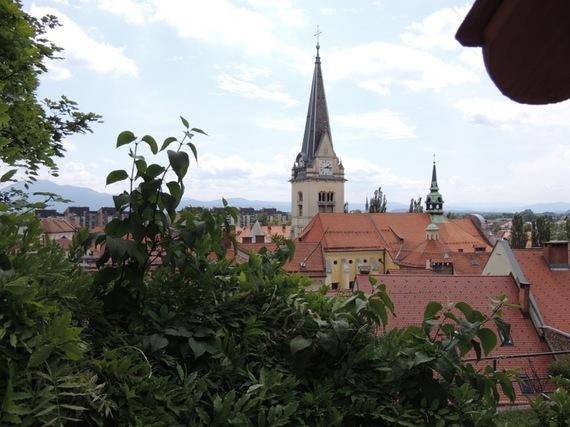 The Ljubljana Castle - and its exquisite restaurants and views - is not to be missed. While the infamous Parisian "love-locks" - padlocks locked to a bridge to signify undying love - have recently been removed, Slovenia's "Lock" Bridge, the Butcher's Bridge, still allows lovers' padlocks. So if it has always been your dream to place a lock on the Pont des Arts Bridge of Paris, visit the less crowded, picturesque Ljubljana instead! The Dragon Bridge is over a century old and sports Ljubljana's symbol - the dragon, and four of them at that. Legend has it that Jason and the Argonauts stopped in Slovenia during their return from the quest for the Golden Fleece, founded Ljubljana, and slayed a dragon. This exquisite bridge lends to amazing views of the old town and the river. If you travel from the Dragon Bridge to the Butcher Bridge and keep walking, you will soon find the most splendid ice cream in Slovenia at "Cacao" - try Slovenia's infamous dark, dark chocolate ice cream with raspberry mixed in! Less than an hour from Ljubljana by car, exploring Skocjan Caves - a UNESCO World Heritage Site - is a chance to journey to the roots of the Earth. With its underground, rushing river, waterfalls, cavernous hollows, stalagmites and stalactites, Skocjan - a place for the adventurer, the nature lover, the historian, and the scientist alike - cannot be missed on a trip to Slovenia. This picturesque lake, a 45 minute drive from Ljubljana, features a castle on a hill, a quaint church on an island in the center of the lake that you can row to, fabulous walking trails completely encircling the lake, graceful swans, and great eateries. Ljubljana was originally - in Roman times - the city of Emona. As Ljubljana is celebrating the 2000th anniversary of Emona between 2014 and 2015, the Roman origins of the city are even more poignant right now. Sprinkled throughout the city are remnants of Emona: city walls, an archaeological park showcasing a house from the time period, and a bronze replica statue of an Emonan Citizen in Zvezda Park near the city center. For the history lover, Ancient Rome still lives on in Ljubljana. Authentic, natural, and magnificently beautiful with kind people, Ljubljana continues to draw me back again and again. So as you are planning your next adventure, look no further than Ljubljana!